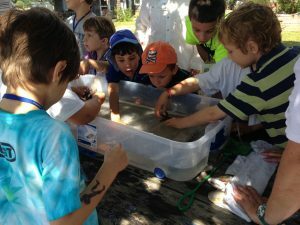 The Branford Land Trust will hold its 22nd Annual Hands-on Environmental Day Camp on Monday, August 14, 2017. This camp, for children ages 5-9, is held at the Killam’s Point Conference Center in Branford. The event includes activities, presentations and games that help kids learn about such things as tide pools, woodland habitats, wildlife rehabilitation, nature crafts, and more. The cost of the camp is $45 for the day (additional children, same family $35.00), or $35 for BLT members. Scholarships available. egistration deadline is Friday, August 10, 2017. Download the Registration Form, or contact Martha Rice at 203-314-7128, mhbrice@gmail.com.